offcntr | Entries tagged with where in the world? Entries tagged with where in the world? ...with a subject line, Quality Pottery!!! "Fun to use your art in Christmas baking!" As near as I can make out from the recipe, there's butter, sugar, vanilla and rum flavorings, flour, eggs and nutmeg. And a rum/buttercream frosting. And a nice use of an Off Center Ceramics mixing crock. Just got an email from a customer, showing how her barn owl tumbler has a new career as a flower vase... in Scotland. Or maybe it's a bairn owl? I sold a bunny pie plate today to a family from Norway. How cool is that? Remembered enough of my western Wisconsin roots to say "magne takk" (many thanks) when she paid me. Had a customer come in today with a "Good, you're still here." He'd bought some soup bowls from us three years ago, and his four-and-a-half year-old daughter loves them. When someone comes back after a long stretch, I assume an out-of-towner. Sure enough, he's a philosophy professor from Boston, in town to give a guest lecture on Emerson and Thoreau for the latter's bicentenary. Fortunately for me, he doesn't subscribe to Henry D.'s philosophy. He takes seven soup bowls home with him. There are advantages to keeping the same reserved booth for twenty years. .. 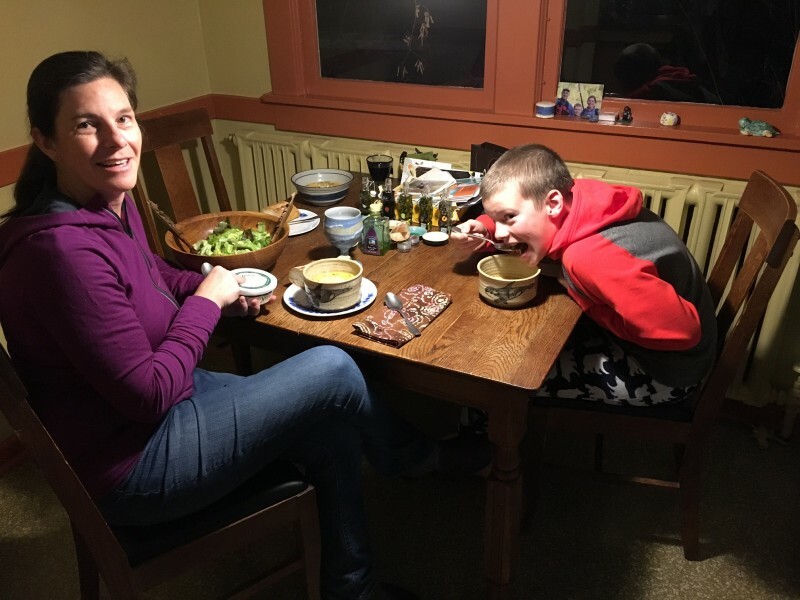 So I was pleased to get this picture in the email the other day: mother and son enjoying their Off Center Ceramics orca soup mugs. The person I made them for is Alaskan by birth, currently living in Seattle, so I'm not sure where the mugs are now, but they're certainly making their new owners happy!